Rooster Teeth is an production company that makes TV series for the internet. Their most famous series (and the one that started them off) is Red vs. Blue, a machinima (which means that it is filmed in a video game, specifically Halo). Red vs. Blue has actually just started its 11th season, which is pretty impressive for something made on the internet. Other series of theirs include P.A.N.I.C.S., Immersion, and now RWBY. Rooster Teeth is also the parent company of Achievement Hunter, one of the most popular video game community websites on the internet. For the past three years, Rooster Teeth has held the RTX convention in their hometown of Austin, TX. Three years isn't very long for a convention to have been around, but this past year, there were over 10,000 people that attended. It's pretty nuts. They had major game publishers there, as well as famous voice actors and lots of panels from industry professionals. This year they also premiered the first two episodes of RWBY. There's no obvious theme here, right? 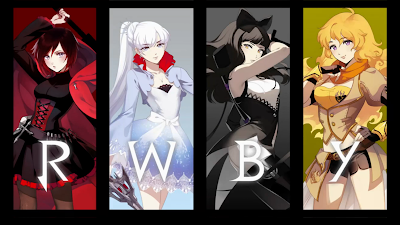 Like I said, RWBY is their new show. However, unlike their previous work, RWBY is not a machinima. It is created entirely from original 3D character models and artwork in the Poser program. And the best part? As you can tell from the above poster, it's an anime. From America. You have no idea how excited I was when I saw the announcement trailer. I had never been to any conventions before this summer. I had read lots of write-ups of different people attending different conventions and they always seemed like so much fun, but because I live in small towns no matter where I am it seems, I had never had the opportunity to go to one. And then I got a job over the summer that would put me less than an hour away from Austin. I might actually be able to go to RTX! I was intrigued, but not super motivated. That is, until I saw that Rooster Teeth had announced that they would be premiering RWBY at RTX this year. That got my attention. I started looking into the feasibility of attending and discovered that the convention started on the day after I got back from Russia, running from July 5-7. I would be tired, but that was pretty much perfect timing. I already had the time off of work, and I would be in Austin itself the night before the convention started. There was no way that I could pass up this golden opportunity. So I bought my weekend pass. I managed to convince Rhamnos, my friend from school, that he wanted to go too (I say convince, but it wasn't a tough sell), and that's pretty much how it went. We stayed at his place in Houston, which is ~2.5 hours away from Austin. The commute of 5 hours every day was certainly not optimal, but it was cheaper than getting a hotel. But of course, RWBY was the main attraction. 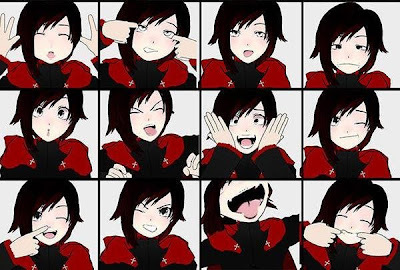 Its creator is Monty Oum, the guy who made the Haloid video several years back. He's an incredible animator that Rooster Teeth hired for Red vs. Blue Season 8, and now he's gotten to create and direct his own show. If anything, the action and fight scenes are even more ridiculous and over the top than his previous work, and it's prefect. I mean, this is anime fighting at its finest. Just watch the Red trailer to see what I mean. You may be wondering, "Since RWBY's from America, can it really be called an anime?" The answer is yes. Yest it can. I mean, even Crunchyroll has been covering it, so I'm pretty sure that it counts. Plus... just look at it. It's an anime. There were three panels about RWBY over the course of the weekend. The first one was the main panel in the big showroom, where they did the premier and answered questions about the story and the characters. They had the main staff on stage, as well as the four main characters. The second panel was the technical one where they explained how they used Poser to create the show and answered questions about how the animation was done (such as how all of the motion capture for the girls was done by men). Finally, the third panel was the art one where they talked about how they designed the characters, and how they changed throughout the time while the show was being created. Apparently they didn't want the girls to have the same colour hair as their name colour, but all of the characters looked similar, so they gave in to anime tradition. All all three panels they showed off the first episode, the unfinished second episode, and the bona fide minute-and-a-half intro for the show, complete with theme song, because that's just what anime do. Ruby doing a Calvin and Hobbes impersonation. The basic premise of the show is that the world is at peace. There are people called Hunters and Huntresses that... hunt... monsters, keeping the people safe. They use a material called Dust that has the property of being magic. The Dust allows them to do all sorts of cool tricks, like create deadly icicles, or shoot fireballs, or make ridiculous weapons like a sniper-scythe. Yeah. It's awesome. Ruby Rose is a 15 year old girl who wants to become a Huntress, so she is in a school that trains people for combat. The other main characters are Weiss, Blake, and Yang, who are all 17. Aside from that... I don' really know where it's going. There are some mysterious bad guys, and teachers that seem to know more than they let on, but Rooster Teeth is being very secretive about the story. I'm really looking forward to seeing where they take it from here. The show floor of the convention was pretty cool too. 343 Industries was on hand, hosting a Halo 4 tournament, The Behemoth was there showing off Battle Block Theater, and there was an area set up with playable copies of Assassin's Creed IV: Black Flag for the first time. Other stations included tryouts for The Gauntlet Season 2 (Rooster Teeth's gaming reality competition show) and a playable demo that showed off the Oculus Rift, the virtual reality headset that makes it seem like you're actually in the game. That last one was pretty sweet by the way. All in all, my first convention was a really awesome experience. I got to play with cool tech, I learned real important skills, I got to see a world premier, and most importantly, I had tons of fun. Conventions are definitely something that needs to be experienced with a friend though. Everything was infinitely better just by having someone there to discuss it with immediately afterwards. Now, go watch the first episode of RWBY. Here. Do it.